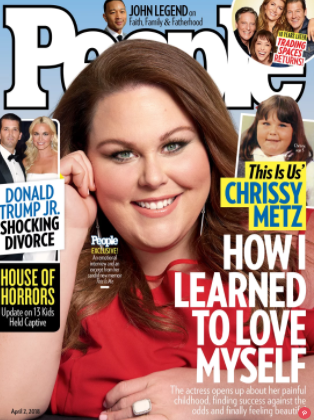 -In her new People cover, Chrissy Metz talks about her terrible stepfather, who hit her and mocked her weight. -I always love the power stylist issueof THR. I especially found the roundtablefascinating, in which they talk about the challenge of dressing their clients in black for Time’s Up, and how they usually lose money during awards season. -Meanwhile, Drew Barrymore is endorsing Crocs and it kinda works? -Oooh boy. A writer on The Vampire Diaries shared her horrifying storyof being harassed by a director on the set. For some reason, a lot of people on my Twitter TL don’t seem to like that show’s creator, but I love the fact that as soon as she heard what happened she said “It is not your job to take abuse or accept unacceptable behavior because you’re young and a woman. That is not your job.” Also, according to this tweet, the guy has gone on to direct Arrow, Gotham, and Lethal Weapon. -This Mads Mikkelsen quote about starring in a Beyonce video is perfection. I saw him two years ago at TIFF and though I hated his movie, the Q&A with him afterwards totally made up for it. -Why is it news that Jennifer Aniston and Justin Theroux have barely spoken since they split? That’s what “split” means. –Millie Bobby Brown and Gaten Matarazzotweeted their support after a kid threw a Stranger Things-themed birthday party and no one showed up. –This trailer for a short film starring Stephen Amell looks like a Canadian version The Florida Project (and I mean that in a good way). –Gillian Anderson being unable to figure out how her watergun works to get back at David Duchovny is the cutest thing ever. -This is a good reviewof Jack White‘s new album, which is reportedly not good. -Netflix is adapting the YA novel To All the Boys I’ve Loved Before, which I adored. –Tessa Thompson makes a cameo as a personal trainer in Portlandia’s series finale. -Also, she’s super into the Twitter feed that compares her to goats. -Speaking of endings, I don’t watch Once Upon a Time, but it’s sweet that original stars Jennifer Morrison, Ginnifer Goodwin, Josh Dallas and Emilie DeRavin all agreed to return for the series finale. –Mila Kunis and Kate McKinnon make terrible accidental secret agents in The Spy Who Dumped Metrailer. Isn’t Chrissy Metz from This is Us? Oh geez – you’re right. Thanks!